This coffee brewer is the bomb!!!! 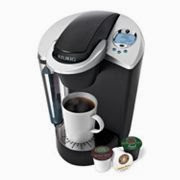 I love that you can choose from three sizes (6, 8, or 10 ounces)It brews coffee, tea and other beverages in one minute. A 12 K-cup variety pack and water filter is included with package. Most retailers have this on sale for $149.99. If you have a coffee lover on your list this is a must have!!! !